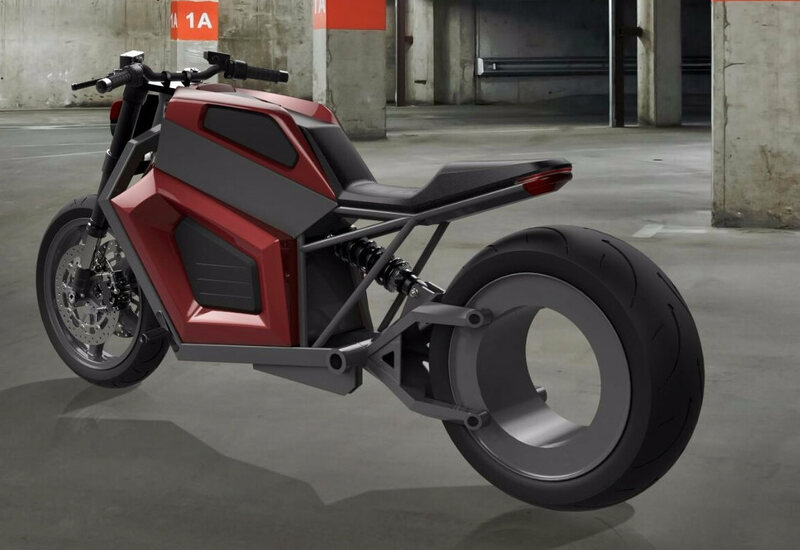 Finnish company RMK has developed a hubless motorcycle that it intends to manufacture later this year. The RMK E2 places the electric motor inside the rim of the rear wheel. Claimed output is 67 HP and 236 pound/feet of torque. RMK claims range will easily exceed 100 miles. With the electric motorcycle incorporated in the rear rim, one of our first thoughts is that this rim/wheel combination would be quite heavy, and that the large, unsprung weight would affect suspension performance adversely. RMK is apparently claiming, however, that the rear rim/tire is remarkably light … even lighter than some conventional tire/rear wheel combinations. RMK Vehicle Corporation Is A New Finnish Company And A Motorcycle Manufacturer. We Will Launch Our First Model E2 During This Year (2018). At The MP 19 Motorcycle Show In Helsinki, Finland, We Will Release The E2 Series Production Version. 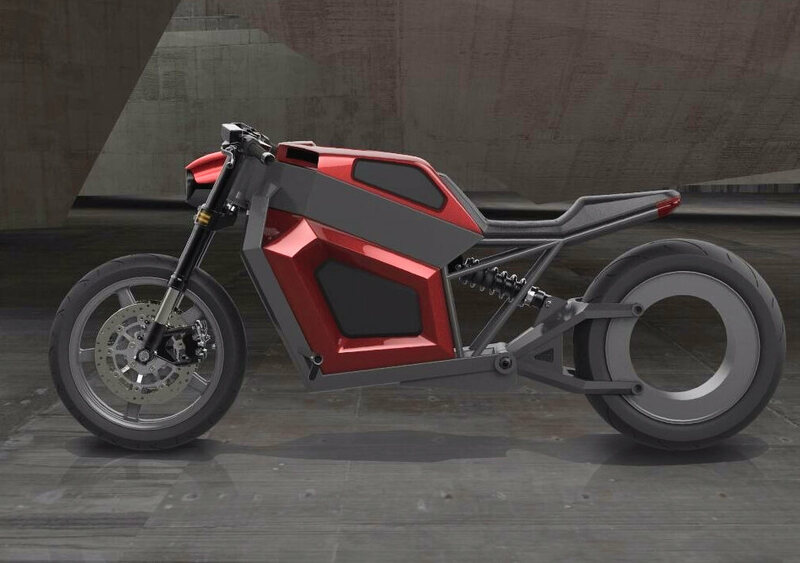 The E2 Is An Aluminium Frame Electric Motorcycle. Its Modern Design Stretches The Limits Of A Traditional Motorcycle Design. We Share Pictures, Videos, And More Information On Our Websites And Social Media, Because We Believe That Trust And Transparency Play A Vital Role In Our Business. The Bike Manufacturing Will Begin On A Smaller Scale During The Summer Of 2018. The First Ones Have The Opportunity To Get E2 To Drive At The End Of 2018. A Large-Scale Manufacturing Will Begin After The EU Type Approval Is Granted. The First Bikes Are Sold At A Fixed Price, Pre-Registered In Finland. If You Wish, You Can Reserve A Motorcycle With A Prepayment Of EUR 2000. Motorcycles Are Delivered In The Reservation Order. You Have A Possibility To Cancel Your Reservation And To Have Your Prepayment Repaid In Full. At The Beginning Of Deliveries, You Will Receive An E-Mail With A More Accurate Delivery Time And Instructions On How To Pay The Final Balance. Your Prepayment Is Deducted From The Total Price Of The Bike. You Can Support RMK Vehicle Corporation By Purchasing Our Accessories. What about rear brake ? Regen ? Teets on a billy goat are more useful than the bike allegedly represented by these computer renderings. You also have the “possibility” of winning the Super Lotto. Not a big one, but more than zero. Who has both the required funds and stupidity to give it to the company who published the above sentence? I call BS on the whole thing. Pre-orders are being accepted right now? Who could be that stupid??? That rear wheel is ridiculous, if it has the electric motor, its suspended weight should be huge and the handling will be atrocious. Can’t be taken seriously. 80 hp electric motor weighs 30 lbs. moe the handlebars up a smidge’r two, please. tyvm. “With the electric motorcycle incorporated in the rear rim”, was that meant to be “electric motor”? Electric motors use magnetism created by electic current flows to attract and repel other magnetic fields. The resulting relative movements between the two fields can be rotational or linear. The conductors to the stator would reside in the swingarm. A number of methods can create and control or switch the polarity of the revolving field or the stationary field can be manipulated to accomplish the same. Motors can be sealed via their insulation or seperated by materials which are substantial but transparent to magnetic fields. There are a lot of lightweight road going motors out there. This takes advantage of housing the electrics in a structure that is already required. Two or more functions for the weight penalty of one is always a good thing. The design ignores first-term effects of wheel design for the sake of styling and perceived performance. Just keep that in mind. Some guy named Buell made similar mistakes. I have designed hollow hub brush less PM motors and joints for robot and other equipment, know of what I speak. You will not see these at Starbucks. Huh? I always thought the current trend, was to make wheels as light as possible, not incorporate 200 lbs into them? saying that putting the weight of the engine, inside the wheel, is a good thing, is preposterous. It’s not until you know how much it weighs. It’s not the weight of the engine, it’s the weight of an electric propulsion motor. Much less than an engine. Still much more than a chain & sprocket, certainly. This thing is vaporware. I have yet to hold any electric motor that is not heavy. $50k really? You could hold it though. That isn’t heavy. 80hp=30lbs. You don’t have to like it or buy it but options are here. The surface speed & drag of seals at rim diameter kills this design. Figure something like 400 feet per minute at 60 mph. Axles rule. Typo: 4000 feet per minute. This is basically the same comment I made over on RideApart about this design, in regards to hubless wheels. Look cool, but not really practical. Also while the wheel itself might be light, all the drive stuff around and just in front of it (motor, gears, whatever) is unsprung weight. Why not just go with a conventional hub motor if they want to eliminate the drivetrain? This is a scam. Maybe they should call it Trump Motorcycles. How are those tariffs working for you. How is the battery EMF conducted into the embedded motor? The grey hub has the coils of the motor. The tire is mounted on the magnetic rim. I get that. I was just wondering how they get the power from the batts across the swingarm pivot and through those 4 bolted joints. With a coating the swingarm and bolts can BE the conductors. Everyone needs to stop thinking about how stationary electric motors are designed and how much they weigh. They were designed to be stationary and as inexpensive as possible. If you change the mission you change the materials and design accordingly. They’ll work that out after they get your reserve prepayment. When is Harley Davidson going to release the Livewire electric bike? it is way cooler than this one. And it was going to be released at a lower price. Electric powered vehicles do not reach the kinds of speeds where streamlining is a major factor in performance (unless they are going for a record, in which case everyday performance is compromised). To my thinking, the wheel might not be overly heavy (compared to shaft drive for instance), but the leverage exerted by drive components at the rim as opposed to the centre axle line, would appear to be considerably greater. This would affect suspension performance. But if it works, this could be a breakthrough. You have to wonder if a special set up would be needed to replace the rear tire. I am certainly considering an electric bic for my daily commuting, so far Zero is in the lead. I am sure it is a tubeless tire so you don’t need to remove it to fix a flat. To change the tire, the wheel comes off by removing four bolts. It may not be a conventional pneumatic, it also appears that the hub can be split. If this bike is production ready now, how come the ones pictured are just cg and not actual photos? I call Scam. Supporting your opinion, is their claim of 50 “computational” KW. What, haven’t they even made a working prototype yet that could be tested, they’re claiming a theoretical power output? I wouldn’t even “think” of putting a deposit down on a machine that hasn’t had pre-production testing done by an independent 3rd party. “But”, you say, “The deposit is fully refundable”. As Wimpy used to state, “I’ll gladly pay you Tuesday for a hamburger today”. 23,900 Euros? Over $30,000? Give me a break! Most sport bikes have 800 to upwards of 1200 ft-lbs of torque at the rear wheel (in first gear). A SV650 has a little over 700 ft-lb of torque at the wheel in first gear and around 250 ft-lb in 6th gear. This bike would be like riding a SV650 in 6th gear all day without the benefit of downshifting. I think you are off by a decimal point. No, my math is correct. You are thinking of advertised torque which is what is generated at the crankshaft. I am using these numbers and calculating what the torque would be at the wheel considering the 15.4:1 first and 5.33:1 sixth overall gear reduction in the SV650 as an example. Maybe I’m about ten percent off due to losses in the transmission. My point still stands that this electric bike would lose a drag race against a SV650 starting out in 6th gear. electric motors tend to produce higher torque numbers relative to similar peak power IC motors. 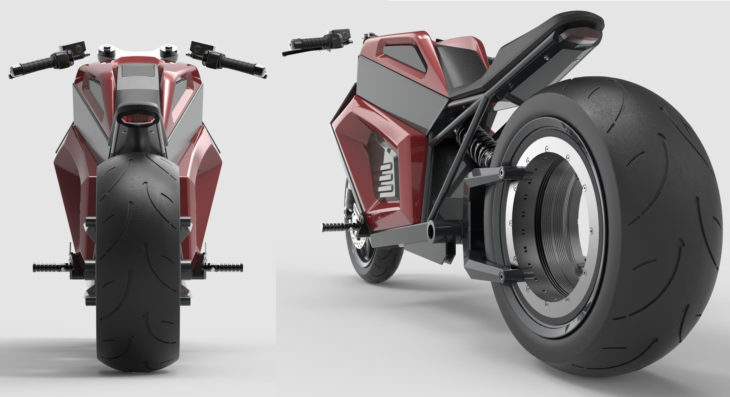 A rear wheel with a 67hp electric motor in it… that’s lighter than normal rear wheels? Yeah, right. Writing PR releases is easy, engineering is hard. The 236 pound-feet (NOT pound/feet) torque number is also suspect – gasoline engine torque is measured at the output shaft, and here the “output shaft” is presumably the rear rim, so this torque number is not at all comparable to torque numbers we’re used to seeing. My read on that was that they were claiming the tire and rim (just the part the tire is mounted to) is lighter than a whole conventional motorcycle wheel and tire to side-step addressing the weight of the stator coils, magnets, controllers, bearings(? )and other parts, which would have a total weight far in excess of just about any motorcycle wheel. current produces a magnetic field, aluminum is light and a good conductor the wheel could be made of aluminum or a lighter material with aluminum windings embedded, why would you but controllers in a wheel hub? motors can easily use magnetic centering for bearing loads with some no or low power coaster mechanical bearings for back up. Aluminum is a terrible conductor and has very poor heat resistance. ie. it would quickly melt under the loads required for Electromagnetic motors. In order to be durable enough for performance and utility work, motors are made with high purity copper windings and powerful permanent rare-earth magnets (usually neodymium). Attempting to use magnetism for bearing loads would absorb a lot of power, which is already at a premium on a battery powered vehicle. Aluminum carries more transmitted power than any other material on the planet. Mag lev doesn’t use much power at all it is simply repulsion instead of attraction. Aluminum is 61% as conductive as copper. This can be counteracted by increasing volume to make up for the loss, while still yielding a weight savings, but for the motor application, size matters, as does heat resistance, another area where aluminum is weak. Good for high-wires, not good for high performance motors. just like copper you just have to keep it within in it’s working limits. An aluminum wound motor can do more electrical work than a copper wound one per unit of weight. The temperature limits of electrical motors tends to be limited by the insulating materials not the conductors. The answer to the quextion nobody axed? World wide sucker production needs to ramp up as the current level of one born every minute just ain’t gonna cut it no mo’. Looks like something a “Minion” would pilot in a cartoon short. I kind of like the look but it will obviously be a bit different if it reaches production. Hope the rear wheel setup works like they say it does. Those foot pegs. Seat is for looks? Obviously aimed at the US market, but even a HD rider would have problems with these ergos! Whatever, the whole thing doesn’t really merit comment. Who’d trust any copywriter who got his caps-lock stuck on? Obviously aimed at the US market but with part-racer part-cruiser ergos, even a radical HD rider would have problems. Really the whole thing stinks. Who’d believe a copywriter who had his caps-lock stuck on for impact? Looks largely unfinished (unintended pun). I’d like to see the actual production bike. Numbers are on paper only at this time. They are promising what people want (remind you of someone?) not what they can deliver. It never rains in Finland. It does snow however so I’m not sure where you can get a 300/35 series knobby tire for winter. You need a spiked tire for snow or ice. Spikes, or studs, screwed into the thick rubber of the ‘knobs’.